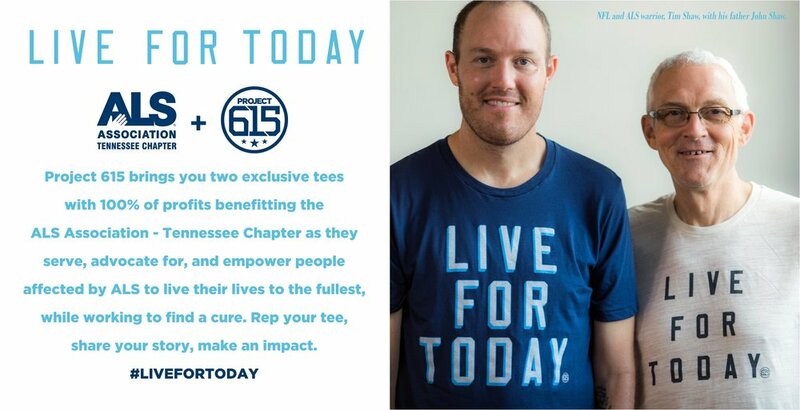 Tennessee Titans 2017 Team Captain Tim Shaw has joined forces with Nashville’s leading apparel company, Project 615, to raise money and support for the ALS Association - Tennessee Chapter through the sale of two exclusive, limited-edition “Live For Today” tees. Project 615 will donate 100% of the profits from the tee sales to the local chapter of the national nonprofit, that serves, advocates for and empowers those affected by ALS, while working to find treatments and a cure. The funds will help sustain the organization’s “hands-on approach,” including patient services like home visits, support groups, speech programs, equipment loaning and more. The “Live For Today” campaign was inspired by the former linebacker’s steadfast message about moving forward in the face of adversity. Shaw faced his own ALS diagnosis in 2014, after the grueling disease had ended his three seasons with the Titans and seven-year career in the NFL. Since then, he has authored a book, was named a “Titan for Life” after being signed to a one-day contract by Head Coach Mike Mularkey, and most recently, chosen by his teammates to lead them as one of six captains. Project 615 and Shaw hope the tees’ message will encourage advocacy for those affected by ALS, while also empowering our own communities to find and enjoy a life with purpose. “Live For Today” tees can be purchased at Project 615 retail locations in East and West Nashville, and online at project615.org. Rep your tee, share your story, make an impact.